We can’t express how glad we are that high-rise denim is back in a big way this fall. The trend looks great on everyone (and we do mean everyone). They draw the eye upward to lengthen legs and banish the muffin-top effect in the process. And where better to shop cool-girl high-rise denim than Levi’s? This season, the iconic brand has a lineup of high-waisted jeans we can’t wait to try on, from super-skinny styles to wide-legged cropped iterations. And if it’s retro appeal you seek (we see you nodding your head), you can’t go wrong with the classic “mom” cut—just add a ’90s-inspired leather jacket to channel Winona Ryder, the Reality Bites years. Read on for more styling tips on this season’s go-to high-rise denim styles. 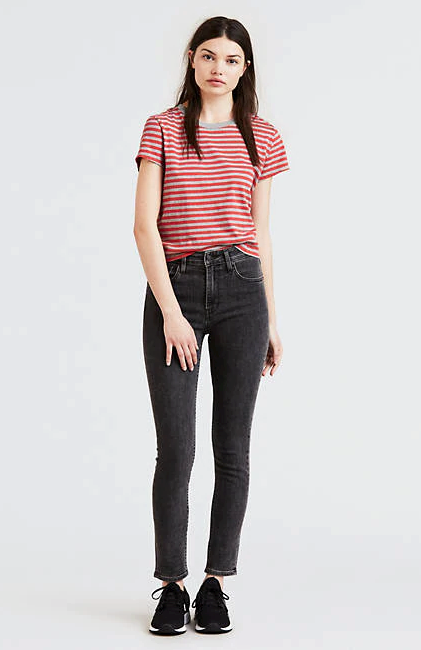 Levi's 721 High Rise Skinny Jeans, $98. High-cut jeans that smooth out our midline? Don’t mind if we do. Slim through the leg but not too skinny, this figure-flattering style looks as good as it feels, and pairs well with French-tucked sweaters and tees. Levi’s 724 High Rise Straight Crop Jeans, $98. Levi’s new 724 style combines a slim hip and thigh with a straight leg for maximum comfort and versatility. Crafted in formfitting stretch denim, this high-rise cut hugs your curves and holds you in all the right places. Levi’s Mile High Super Skinny Jeans, $108. Count on these super-skinny black jeans for a slimming look. Featuring the brand’s highest rise, these are an ideal match for your crop tops, and great for balancing out billowy blouses and oversize knits. Levi’s Wedgie Fit Straight Jeans, $108. There’s no question you’ll want to tuck your tops into these high-rise jeans. Even better, the slim shape through the hip and thigh gives way to a pleated hem worth flaunting (all the better to show off your new fall boots). Levi’s High Water Wide Leg Jeans, $108. Shin-grazing denim culottes are sure to turn heads. Wear these high-rise wide-leg jeans with sandals or clean white kicks as long as the weather is warm; then add a pair of ankle boots come fall. With their relaxed high-rise fit and cool vintage vibe, it’s no wonder “mom” jeans are all the rage this season. A modern and more flattering take on the easygoing style of years past, it’s an on-trend pick with plenty of throwback appeal.